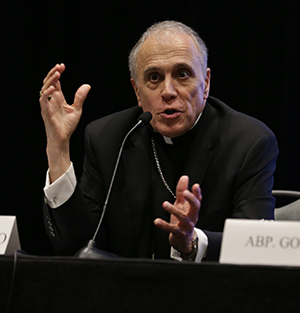 Cardinal Daniel DiNardo of Houston, president of the U.S. bishops’ conference, answers reporters' questions during the U.S. bishops' meeting in Fort Lauderdale, June 13-15, 2018. Let me ask you to hold us to all of these resolutions. Let me also ask you to pray for us, that we will take this time to reflect, repent, and recommit ourselves to holiness of life and to conform our lives even more to Christ, the Good Shepherd.